What Can I Put on My Peace Lily Leaves to Make Them Shine? With their dark-green leaves and fragrant white flowers, peace lilies (Spathiphylum spp. and hybrids) are common houseplants and gifts. They're also one of the few plants that bloom reliably in low-light conditions, making them useful for offices and rooms with little available window space. The long oval leaves are naturally glossy and only require regular dusting and periodic showers to keep their soft shine. Leaf shine solutions should be used rarely and with care. Grow peace lilies in moist, well-drained soil and bright, filtered light for best performance, although they're tolerant of low-light conditions. They only need feeding every two or three months with a balanced houseplant fertilizer. They're not tolerant of cold drafts, however, growing best with daytime temperatures of 68 to 85 degrees Fahrenheit and night temperatures about 10 degrees cooler. 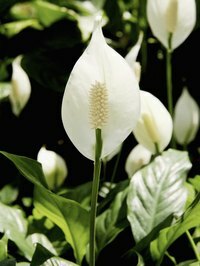 Cultivar sizes range from the miniature, 12-inch Wallisii to the massive, 6-foot Sensation, so there are peace lilies to fit any location in your home. Dirt and dust that settle on your peace lily block light and diminish the plant's ability to photosynthesize, or use light to produce food. The gentlest way to clean leaves is with a feather duster. If you make plant dusting part of your regular cleaning routine, more drastic measures are rarely needed. However, even plants need a bath once in a while. For peace lilies in small containers, cover the soil with aluminum foil and set the plant in the kitchen sink. Use the sprayer attachment to rinse off both sides of the leaves with warm water. Larger plants can go in the shower. Wipe rinsed leaves off with a soft cloth to prevent water spots and give the foliage a soft, natural shine. For containers that are too awkward to move, wipe the top and bottom of each leaf by hand with a dampened paper towel, then dry with a soft cloth. Plants growing near kitchens often accumulate an oily residue, so use a few drops of mild dish soap or baby shampoo in the water and wash the residue off by hand. Both homemade and commercial leaf shine products will make your peace lily's leaves bright and shiny, but at a cost. These products deposit a light oily or waxy film on the leaves that can clog the leaf pores and interfere with the plant's transpiration, or oxygen exchange. Extended use can stunt the plant's growth. In addition, the products are counterproductive, as the product film attracts and holds dust, making cleaning the plant more difficult. To keep your peace lilies at their healthiest, avoid routine use of leaf shine products. Regular dusting and periodic showers keep the leaves naturally clean and shiny. If you want to give your peace lilies a little extra shine for the holidays or other special occasion, instead of spraying the leaves directly, apply the leaf shine product to a soft cloth and wipe the leaves by hand so that you apply only the thinnest possible film.